Cannabidiol, or CBD, is the non-psychoactive cannabis compound touted for its medicinal promise. In addition to the 29 states, the District of Columbia, Guam and Puerto Rico that have legalized some forms of marijuana, 18 states allow use of CBD-rich products for medical purposes, according to the National Conference of State Legislatures. CBD has recently become more widely available — it’s even in mainstream grocery chains — and it appears the cannabis compound is confounding state law enforcement agencies and news outlets. The Halloween weed scare of 2017 appears to have originated in North Carolina, where medical cannabidiol was legalized in July 2015. Cumberland County Sheriff Ennis Wright said his school resource officers haven’t come across any of the CBD products on school campuses, but the color of the packaging concerns him. Jason Locklear, an agent with the state Division of Alcohol Law Enforcement, said shops in the Cumberland County area are sold out of lollipops with CBD. He’s also concerned about a vaporless inhaler that gives a person a hit of the compound. The Poison Center at Tampa General Hospital is warning parents to be on the lookout for these candies. Dr. Fred Aleguas is urging parents to double check all candy wrappers closely. He is also issuing a reminder to not let your kids eat any homemade goodies passed out during trick-or-treating. WFLA’s story was then picked up by Albany, N.Y. ABC affiliate News 10, which didn’t add an Empire State angle. Despite zero evidence of THC-laced treats being handed out to children since legalization took root in Colorado and Washington, Halloween 2017 has seen its share of marijuana candy sensationalism. The document cites the case of a 10-year-old New York boy who police said became ill after eating candy infused with cannabis found in the back seat of his family’s car, but that had nothing to do with Halloween, according to the Associated Press. Nonetheless, the New Jersey document has been republished across social media and in local news reports in New York, Philadelphia, Miami and Austin. Down in Mississippi, the Oct. 9 arrest of a Gulfport man with “760 units of edible candies laced with THC” had the state’s Bureau of Narcotics dirctor imploring residents to check all treats given to children on Halloween. “The THC was disguised in popular candy that appears to be peach rings, gummy worms and strawberry gum drops. Each bag of candy had a label that said it had 100 mg of THC inside,” according to The Sun Herald of South Mississippi. States that have legalized recreational use of marijuana have taken steps to ensure that edibles sold in dispensaries cannot be confused with candy. Colorado’s ban on marijuana edibles shaped like humans, animals, fruits or cartoons went into effect on Oct. 1. 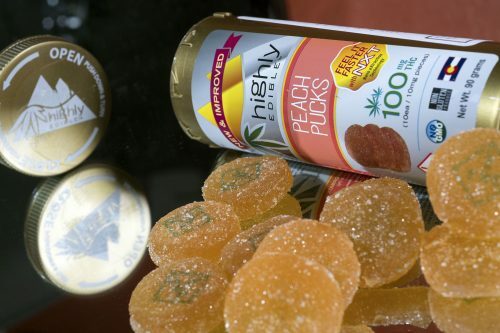 The state also requires a universal THC symbol stamped on each 10-milligram standard serving, the inclusion of potency and contamination testing information, and the barring of words such as “candy” or “candies.” The state is also requiring more prominently displayed potency information on the labels of cannabis products. As far as Halloween hazards go, children have a greater chance of being fatally injured by a car on Oct. 31 than any other day of the year, including the Fourth of July and New Year’s Day. So be safe, have a Happy Halloween, and please remember to keep cannabis products out of the reach of children.